10 eggs arrived at school in an incubator. We learnt about animals that lay eggs, matching the different eggs to their species. The children then matched egg pairing cards and labels. We carried out an eggsperiment, placing a chicken egg in white vinegar…. We will observe the egg and find out what happens next week! We learnt about why birds make nests (to protect their eggs) and what they are made of (twigs, grass, mud etc). The children then pretended they were birds and went foraging for materials to make their own nests. We looked at the similarities and differences between ourselves and chicks e.g. we have 5 toes on one foot, chicks only have 4. We also learnt that our brown chicks are females and our yellow chicks are males. Hen – a grown up, mother (female) chicken. Cockerel/Rooster – a grown up, father (male) chicken. Incubator – A heated box for eggs to hatch without a hen. 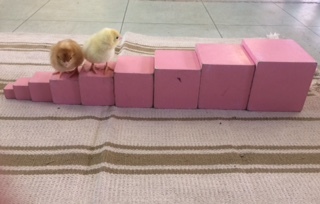 Brooder Box – A heated box to raise chicks.